A Boeing Delta 2 rocket successfully launched NASA's IMAGE space weather observatory on March 25 from Vandenberg Air Force Base, Calif. 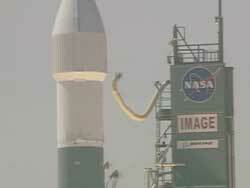 Images: NASA TV/Spaceflight Now. The 177-foot tall mobile service tower is rolled away from the Boeing Delta 2 rocket at Space Launch Complex-2 West before sunrise on Saturday morning. 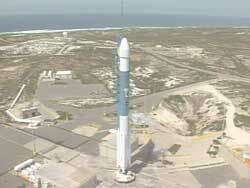 A camera mounted on the mobile service tower shows the Delta 2 rocket awaiting liftoff. This scenic view shows the Pacific Ocean in the background. 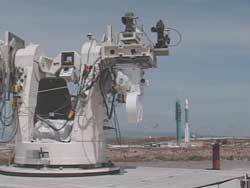 This tracking camera is poised to capture the rocket's thunderous launch toward space. The twin vernier steering jets and the first stage main engine roar to life in the final two seconds before blastoff. 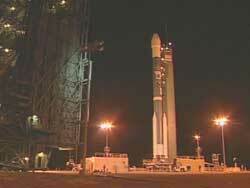 Umbilical lines connecting the Delta 2 rocket to Earth fall away as the vehicle departs the launch pad. The yellow line is the air conditioning vent to the payload. 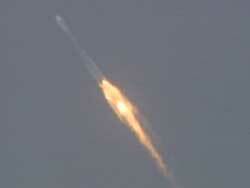 The three-stage Delta rocket soars into the midday sky at Vandenberg Air Force Base in Central California. The three strap-on solid rocket boosters burn out just over one minute into flight. 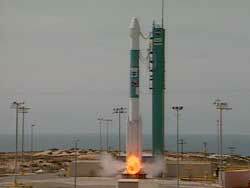 The first stage main engine and two vernier steering jets continue to fire.